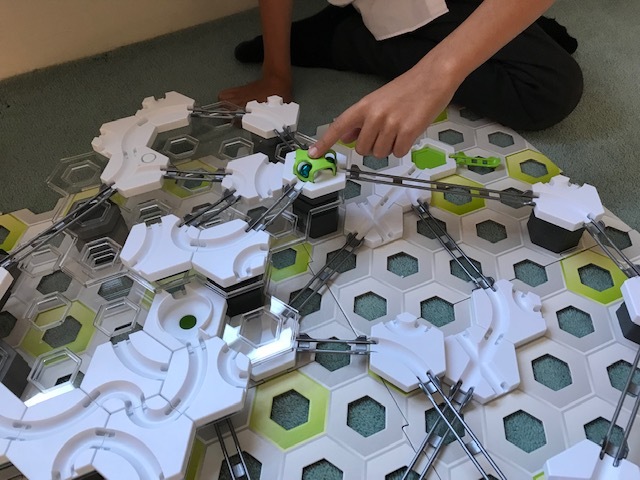 GraviTrax from Ravensburger is a new interactive track system which you can use to design and build your own race tracks, sending the balls racing to the finish line. The small marbles, known as gravity spheres, can be propelled through the track using the power of gravity, magnetism and kinetics, and you can create unique tracks that are different every time. 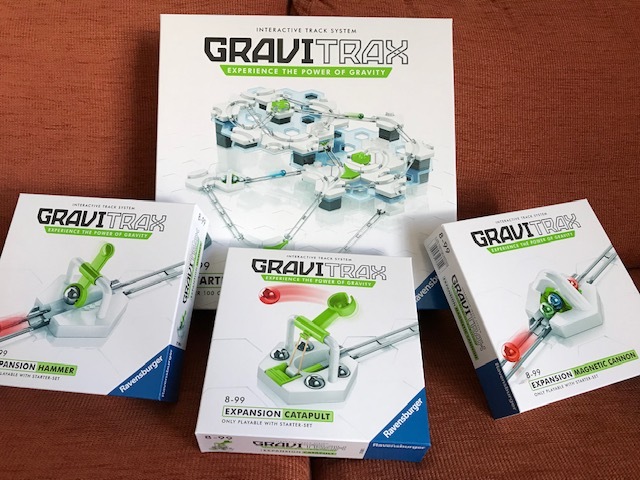 We were sent the GraviTrax Starter Set to try out in exchange for a review, along with three expansion sets - the Catapult, Hammer and Magnetic Cannon. 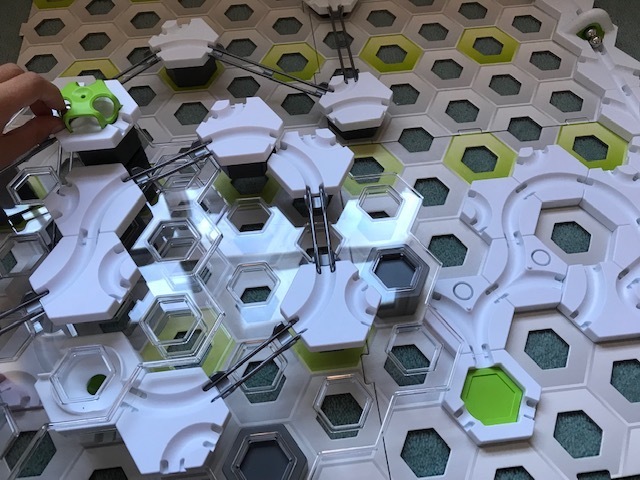 The GraviTrax Starter Set comes with over 100 components, including pieces of track in three different lengths, a number of height tiles, and hexagonal shaped pieces with grooves that can be used to guide the balls in different directions. There's a launch pad which can send up to three balls on their journeys at the same time, as well as various special pieces to join and divert paths. The layout is built upon four cardboard base plates which are slotted together to form the foundation, with hexagonal holes to keep the pieces in place. The cardboard base is stable, even on a soft surface like carpet. Height can be added to the track using the two transparent level plates by building pillars of height tiles. The set comes with a large book of construction plans, graded by difficulty level. When you are familiar with the different pieces and how they fit together you can move onto the tasks. These ask you to complete layouts by solving a variety of challenges which are graded by difficulty, for example working out how many height tiles you need to add or which elements are missing. As soon as he saw the set, Harry (aged 9) couldn't wait to get stuck in. He began by following some of the basic designs, and it didn't take him long to work out how the different pieces fitted together and understand what he could do to create his own layouts. He quickly moved on to advanced projects, and he much preferred coming up with his own designs to attempting the puzzles in the book. The individual pieces are really easy to fit together and take apart, and remain yet sturdy while the track is in use. In the Starter Set there are plenty of different pieces, so you have a huge variety of options. There is the opportunity to get creative and build some really complex layouts, and plenty to keep the brain busy while you work out the best way to build what you have in mind. The children have always have fun playing with marble runs, and the GraviTrax system is definitely the best one yet. 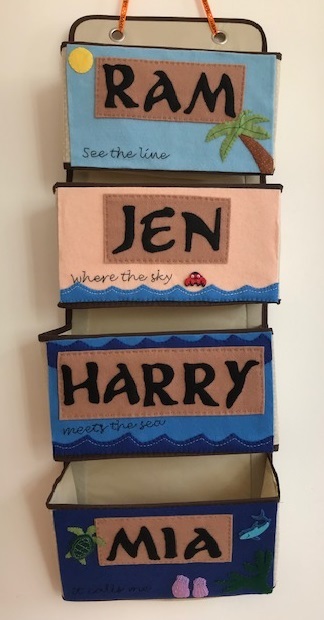 I think it's the way that the pieces themselves are individually quite simple, yet fit together really well in so many different ways that you really can customise your layouts and be really inventive with it. 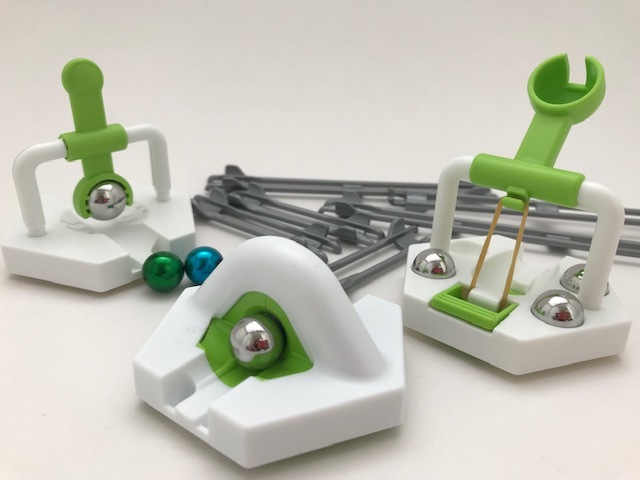 It's worth noting that the gravity spheres are smaller than standard marbles, so you need to use the balls that are included, as standard marbles will not fit the tracks. And to my delight, all the pieces can be easily fitted back into the original sturdy box, a big plus for me when it comes to tidying up! There are several different expansion packs available, including extra track, building pieces and special components. We were sent the GraviTrax Catapult , GravitTrax Hammer and GraviTrax Magnetic Cannon (affiliate links). The Magnetic Cannon is the same as the one included in the starter set, and these expansion pieces are not standalone, they need to be used in conjunction with the full set. The Catapult will fire your ball into the air onto an adjacent piece of track, and the Hammer uses a larger ball to knock your ball along the track. The Magnetic Cannon allows you to place two or three balls on the side of the magnet facing down the track. When another ball hits the magnet on the other side, the first ball will shoot off. These extra items are great for adding more interest to your layouts and would be a fun extra purchase if you've already had the Starter Set for a while and are looking to jazz it up a bit. The free GraviTrax App is a great complimentary feature to the physical product. You can digitally design and test your track ideas with an unlimited range of components, either before building them in real life or just to see where your imagination can take you. It would be especially fun for younger children that don't have the dexterity or the patience to build their own physical layout, but still want to have fun designing their own tracks. In summary, both my children had a huge amount of fun playing with the GraviTrax system, and I know that they will continue to play with it for a long while yet. I loved seeing how they overcame challenges by working out the best pieces to use, and I could see that there was plenty of learning going on. There are so many different possibilities for advanced layouts, even if you just have the Starter Set. The Starter Set has an RRP of £49.99, but it's worth keeping an eye out as at time of writing it is £39.99 on Amazon and I think that is good value. The expansion sets we received each have an RRP of £9.99 which I do think is a little pricey. I'd recommend beginning with the Starter Set and seeing how you get on, because we found that there was plenty of play value in that alone without needing the expansion pieces. I received the GraviTrax Starter Set and three add on pieces in exchange for this review. This post contains Amazon affiliate links.